With London Fashion Week fast approaching it's a good time to remind ourselves of just how unacceptable it is to condone the wearing of animal fur. The images I've seen of skinned rabbits, foxes, cats and dogs – many of them still alive – will stay with me forever. Please let's educate ourselves by reading these useful FAQs courtesy of PETA UK. Some people have been misguided as to the ethics of vintage fur. All 'vintage' means is that the animals were killed long ago. Whether animals suffered and died yesterday or 50 years ago, all fur sends the same unacceptable message: that it is okay to torment animals and rip the skin off their backs in the name of fashion. Isn't real fur better for the environment? Real fur is environmentally unfriendly. Toxic chemicals are used to preserve and process the skins and waste from processing plants and fur farms poisons rivers and streams. It also takes 20 times as much energy to process a coat made from animal fur as it does one made from fake fur! And fur coats are not biodegradable – they are coated in chemicals to stop them from rotting. Is rabbit fur a by-product of the meat industry? The fur industry likes to tell the public that the rabbit fur used for outerwear, trim and accessories is a by-product of the rabbit-meat industry. The truth is that the rabbit-fur industry demands the thicker pelt of an older animal. Rabbits used for meat are usually killed at an age of 10 to 12 weeks; this means the rabbits who are raised and killed for meat are not the same rabbits who are killed for fur. Our undercover exposé shows how these gentle creatures scream during slaughter. Isn't fur carrying the 'Origin Assured' label okay? The fur industry's 'Origin Assured' (OA) label is a shameless attempt to make consumers feel good about buying an inherently cruel product. The labelling in no way translates into acceptable treatment of animals who are killed for their fur. In the US (one of the countries included on the OA list) not a single humane-slaughter law protects animals on fur farms. This means that after spending their entire lives in tiny wire cages where they often go insane from confinement, animals on these fur farms can have their necks broken, be gassed or have rods forced into their backsides through which they are painfully electrocuted. Compassionate consumers know that the only truly ethical fur is faux. Don't we have an excuse to wear fur in this cold weather? This is one of the most ludicrous of all the fur industry's arguments. When mountaineers climb Mount Everest, they don't do it in mink coats! There are countless modern, manmade fibres which are warmer, lighter and more weatherproof than fur. The fact is, some people advocate the killing of millions of animals simply because they like the way fur looks. With all the chic, cruelty-free options available, there's no reason to steal animals' skins in order to keep warm. Please visit the PETA US site for further information about the fur trade. Thanks for this post! People in fur just look ignorant and uncaring. I'm sure they wouldn't be caught dead in it if they knew what the animals had endured in order for it to be produced. Fur only looks beautiful on its original owners! Thanks Laura for letting your readers know how cruel the fur industry is. Go faux! Thanks Laura - people need to know that the fur indistry in absolutely barbaric. Innocent, sentient animals spend their lives in cramped filthy cages, often in all weather extremes before being dragged terrified from their cages, only to endure what is often a botched killing. This means that many animals are still conscious as the fur is literally ripped from their back. This fur belongs to the animals, it is not ours to take, and there can never be any justification for this horrific abuse. I think people have to divorce themselves from the origins of fur in order to wear it. They should have to watch that video, Olivia, before making a purchase! Great post! Totally agree with everything said. 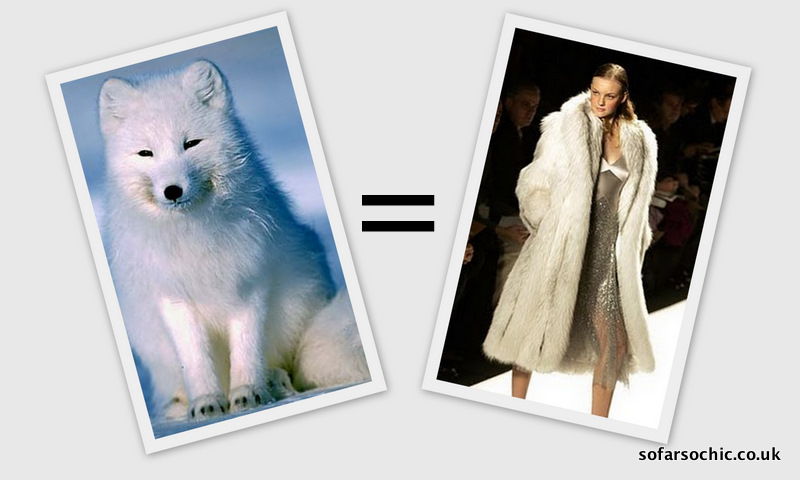 Fur for Fashion = FAIL.